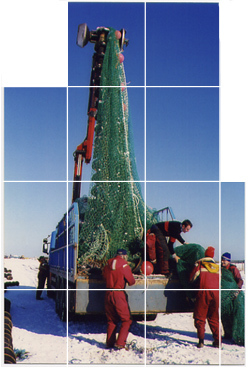 Jackson Trawls Ltd. are the leading independent commercial fishing net manufacturer in Northern Europe. Based in Peterhead, Scotland, we have an enviable reputation for manufacturing top quality fishing nets constructed from the finest materials and components. The key to our success lies in our unswerving dedication to perfecting the fishing performance of our various designs. Indeed our customers are consistently among the top-earning fishermen in their respective sectors. A success, which lies in the joint experience of these expert skippers and our knowledgeable staff combining to ensure maximum fishing effectiveness. Our aim has been to satisfy our customer's requirements in every way, indeed we operate a fleet of vehicles, which can handle any net, be it a small prawn trawl or a massive pelagic pair trawl. Our expert staff have the dedication and skill required to ensure that gear requirements are addressed whenever and wherever Jackson Trawls may be needed. So to our existing customers, we wish you continued success and to prospective customers, drop us an e-mail to see how we can prosper together.